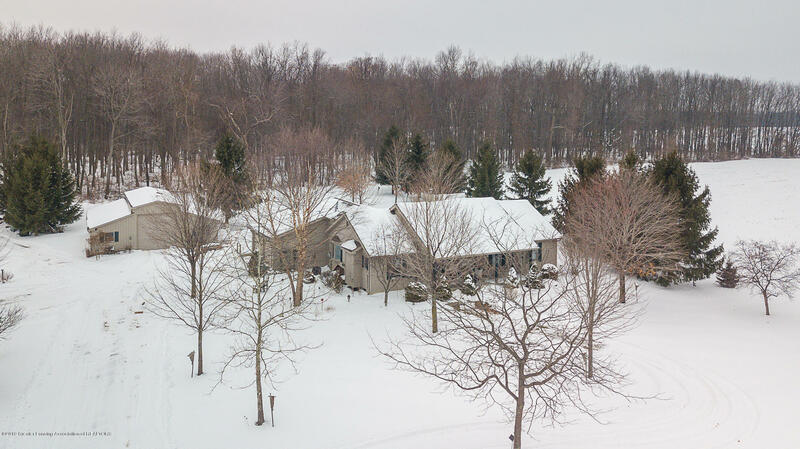 Located on 57 acres of beautiful and fruitful land in the highly desirable area of Williamston, this custom built ranch home and barn offers 3 beds, 3 baths, and views of the 14' deep pond w/ countless wildlife! The light-filled, open floor plan is accentuated by cathedral ceilings and beautiful custom windows. Live & entertain on the main level in the spacious living room, large eat-in kitchen w/ island, and 4 seasons room. The master suite is complete w/ 2 walk-in closets! The lower level offers additional expansive living space, a full bath, egress window, injection pump, and heated floors! Come take a look and soak in the exquisite and peaceful private setting! Directions: Meridian Rd to Haslett Td to Zimmer, R on Epley, house on the left.